As a mental health advocate, I am sometimes asked to share my story with others. This was the case this past weekend when a young ladies parents asked me to share my story with their daughter. Their daughter is a young lady who after achieving a four-year degree in nursing last year she took her first job as a healthcare professional. Not long into her new job she began to exhibit the symptoms that lead to her diagnosis of bipolar II disorder. The young lady was devasted to find she could no longer continue in the career she had worked so hard for. At the end of our time together I think she understood that this is only a setback and her life can still be wonderful even with bipolar disorder. Bipolar sufferers are very caring people no matter what this illness does to us. For those reasons, many of us wind up working in health care in one way or another. The problem is that healthcare is a 24/7 business. It is rare to find a position in healthcare that does not involve having to work revolving shifts. That is the nature of health care. Here is the problem, as a bipolar sufferer to go from day shift to afternoon shift to night shift, or the twelve-hour day/night rotation, and keep up that rotation we inevitably fall prey to our illness. This does not happen some of the time, it happens all the time. We spend years going to school, which is nine to five, to have this great career in healthcare. Then we show up on the job or our practicums, internships, residency or whatever and find after a short time we just can’t handle the changing shifts. I know because it happened to me. I went to school to be a care-aide to work with the elderly and the mentally and physically challenged. Having become more than a few thousand dollars in debt from two years at the technical school I found I could not do the job because I could not do the shift rotation. It was not the jobs fault, it is not the schools’ fault, it is not my employer’s fault. It was not even my bipolar disorders fault. I could not do the job because I have bipolar disorder and having to change shifts every week just does not work for someone with this illness. It is like someone with diabetes taking a job as a sugary treat taste tester, it just is not going to work out well. If you have bipolar disorder and your caring heart is leading you to go thousands of dollars in debt to be a health care provider in any capacity, please don’t. It is difficult to suffer from bipolar disorder, be thousands of dollars in debt and unable to work in the field you have studied so hard to be in. It tends to make you angry and resentful, which is not a good way to live. Please share this post if you know someone who has bipolar disorder and is considering a career in healthcare. Many other people blog on bipolar and related subjects. Mental wellness is all about knowledge and learning about ourselves. The more informed we are the easier our struggles may be. Each week I attach a blog written by someone else that I found interesting that may inform you as well. This is another author’s work I am just attaching their blog for you. I hope you enjoy this week’s blog from the time to Change Website, Author Unknown. To live the life you want to live ACTION IS REQUIRED. THINGS WILL STAY THE SAME. For each of us what we think of or what image comes into our minds when we hear the term, “Mental Wellness,” will be slightly different. We cannot give meaning to that term or bring that image to life unless we do something. If we, as the above quote says, just think and dream about our life of being mentally well, nothing is going to happen, things will stay exactly as they are. We must do something. That is one unavoidable truth is to have mental wellness you must reach for it, it is not going to reach for you, the other unavoidable truth is we cannot change without the support of other people, places or things. We need to develop a support team and system. When most people think of support they think of professionals like their Psychiatrist or their GP or Psych Nurse or a counselor/therapist. It is not wrong to think of these professionals as supports because they are, they are usually the first people we see when we seek help, which does weird stuff to our brain, that is another topic for another day. To reach and maintain mental wellness most of us need more support than just those professionals. My goal over the next year in this blog is to introduce you to the obvious and not so obvious people, places and things that are available to be become part of your support team and system to first reach and then maintain your mental wellness. Your local library is not just a great resource for books and other material that will help you on a journey towards mental wellness and after to help you maintain the mental wellness you have attained. Most libraries today provide programs and other connections that will help you. I took my first boundaries class at my local library. Your local library is a safe place to work on this most important of work, which is working on yourself. Your local library has all the things necessary to find a starting point and grow from there. Your local library has everything, or if they don’t have it they will usually get it, you will need to work on yourself. Think of your local library as part of your support team, I do, and it really helped me. P.S. The quote that I used in today’s blog is three feet tall and four feet wide and resides on the wall of the lower level of my workplace. I have had the privilege of reading and meditating on that quote for the last eight years. It really made a difference in my life. I hope you copy it and put it on your wall and read it every day. I usually use the quotes of others as my affirmations. These affirmations are the things I meditate on to generate the deep conviction required to make things happen in my life or change my mindset. I thought sharing the process I use to make someone’s quote a usable affirmation in my life may help others. My first mentor in mental wellness taught me to make sure I understood the meaning of the words in the context presented. Not what I think they mean, but the actual meaning. To this end his first gift to me was a dictionary. 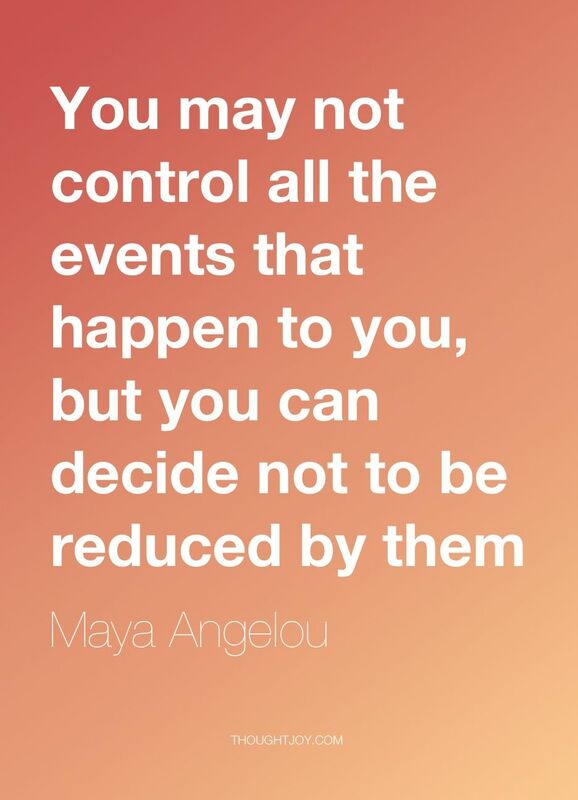 This is the process I used to make this quote of Maya Angelou’s a usable affirmation in my life. The first part of the quote speaks of events. What does the word events mean in this context? Events could mean concerts and parties, but this meaning does not fit the context. What events means in this context is issues and/or situations. Issues and situations happen in our bipolar lives that are for sure out our control. When the issue or situation is out of our control we react and the reaction is usually negative. In most cases this negative reaction leads to a negative mindset and then spirals into depression. The answer was incredibly simple, issues or situations that are not my liking or do not go my way. Issues or situations out of my control or not to my liking or that don’t go my way cause that instant negative mindset. In reading this quote I had to do more work for the quote to make sense. I now understood what the events were. I did not grasp how the word reduced fit. Reduced meant make smaller to me. I had to find a meaning for the word reduce that made sense in this quotation. In looking up the word reduce I found it can also mean to make someone weaker or in a lesser state. That allowed me to change the word reduce to depress. The quote now read, “You may not control (or like) all the events that happen to you (nor will they go my way), but you can decide not to let these events depress you.” Realizing what these events really entailed and that the word reduced = the word depression brought this quote into sharper focus for me and closer to it becoming a useable affirmation on which to meditate. This a quote is a hope quote, providing the hope that “I can.” I can learn that issues or situations do not need to depress me. I have different categories of affirmations. Affirmations of hope, gratitude, personal growth and development, right thinking, belief challenging, and wisdom. I have night time and morning affirmations. I also have categories of themes I meditate on throughout the day that I not only want to understand, but also become. When I find a quote I like, I use this process to make it useable to me and then file it under its appropriate category.